New Melones Lake level is currently at 1028.62 Tuttletown middle ramp is currently in use for lake elevations from 1036.00-942.00. Glory Hole Point side of the lake has the high ramp working till lake elevation hits approx.1025.00 and at that point the middle ramp will be in use from ele. 1028.00 to 940.00. Angels Cove ramp is in use from ele.1088.00 - 975.00. We do promote catch and release. For potential lake records, record the statistics of the fish... length, girth, weight and photographed at the lake before releasing her. If indeed we can verify the information that is provided, such as a witness, comparing the scale used with ours, a photograph with the fish hanging from the scale and can see the scale weight, etc... then we can accept this as proof. If your catch has expired than indeed bring it in to GHS so we can record it here, and you can have it mounted! Slow to get a hookup, trout are being landed from the surface casting to trolling at 45 ft. Targeting trout at this time will likely get you a Crappie or Bass just as easily. 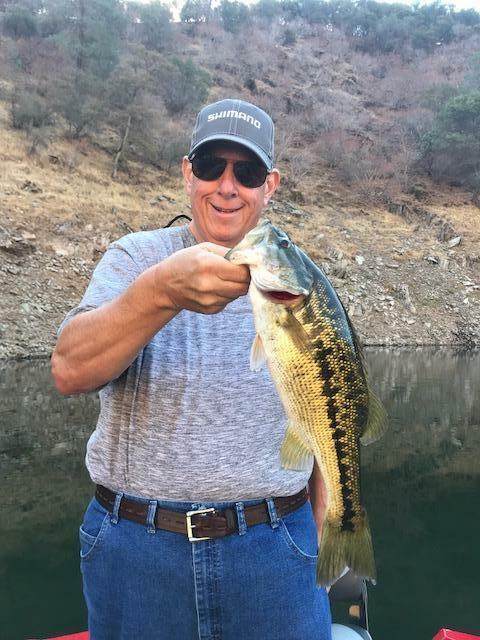 Bass anglers are finding out what a tough bite is on Melones, with the lake slow to turn over and little changes in weather patterns, its likely to continue till we see some good weather event. The Future Pro National Semi Finals were held on Melones Nov. 10th and 11th with the winners going to the championship. 1st. place from California and headed to the finals is Jason Remmers with a two day total of 34.13 lbs, also landing big bass for the tournament of 8.44 lbs. Also qualifying for Ca. is Sharif Zagsaw with 18.47 lbs. Catfish producing strikes are being had early evening to the wee hrs of the morning, south of the dam along shore and Tuttletown coves using chicken livers. There is a melting pot of angling opportunities when you fish over the bait balls. Chances are you'll end up with Crappie, Bass, Trout, or a Catfish while doing so.